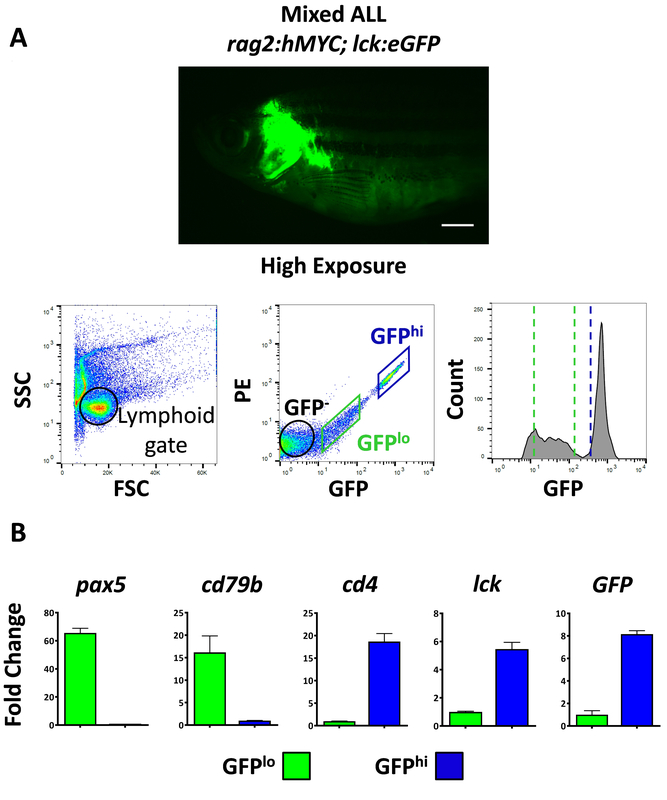 Transgenic lck:eGFP zebrafish express GFP highly in T lymphocytes, and have been used to study T cell development and acute lymphoblastic leukemia. This line can be used to study B cells, which express lck at lower levels. This protocol describes purification of malignant and non-malignant B cells from lck:eGFP zebrafish. Burroughs-Garcia, J., Hasan, A., Park, G., Borga, C., Frazer, J. K. Isolating Malignant and Non-Malignant B Cells from lck:eGFP Zebrafish. J. Vis. Exp. (144), e59191, doi:10.3791/59191 (2019). Zebrafish (Danio rerio) are a powerful model to study lymphocyte development. Like mammals, D. rerio possess an adaptive immune system that includes B and T lymphocytes. Studies of zebrafish lymphopoiesis are difficult because antibodies recognizing D. rerio cell surface markers are generally not available, complicating isolation and characterization of different lymphocyte populations, including B-lineage cells. Transgenic lines with lineage-specific fluorophore expression are often used to circumvent this challenge. The transgenic lck:eGFP line has been used to study D. rerio T cell development, and has also been utilized to model T cell development and acute lymphoblastic leukemia (T-ALL). Although lck:eGFP fish have been widely used to analyze the T-lineage, they have not been used to study B cells. Recently, we discovered that many zebrafish B cells also express lck, albeit at lower levels. Consequently, lck:eGFP B cells likewise express low levels of GFP. Based on this finding, we developed a protocol to purify B-lineage cells from lck:eGFP zebrafish, which we report here. Our method describes how to utilize a fluorescent-activated cell sorter (FACS) to purify B cells from lck:eGFP fish or related lines, such as double-transgenic rag2:hMYC; lck:eGFP fish. In these lines, B cells, particularly immature B cells, express GFP at low but detectable levels, allowing them to be distinguished from T cells, which express GFP highly. B cells can be isolated from marrow, thymus, spleen, blood, or other tissues. This protocol provides a new method to purify D. rerio B cells, enabling studies focused on topics like B cell development and B lymphocyte malignancies. Zebrafish offer powerful attributes, such as genetic manipulability, high fecundity, optical translucency, and rapid development that facilitate studying vertebrate development using genetic approaches. These advantages, together with the shared features of teleost and mammalian hematopoiesis, make D. rerio ideal for in vivo analyses of lymphopoiesis and lymphocyte function, from their earliest appearance in larvae throughout adulthood. Blood development in zebrafish relies upon well-conserved genetic processes that are shared with mammals, and these extend to the adaptive immune system. Additionally, molecular mechanisms governing lymphoid development are remarkably conserved between zebrafish and mammals1. Over the past 2 decades, transgenic D. rerio lines that label specific blood lineages and mutant lines deficient in these lineages have been created2,3,4,5. One of these, the lck:eGFP transgenic line, uses the zebrafish lymphocyte protein tyrosine kinase (lck) promoter to drive GFP expression6. This gene, which is highly expressed by both T-lineage precursors and mature T lymphocytes, allows in vivo tracking of thymic T cell development and ex vivo purification of T-lineage cells by FACS7. Previously, we used this line in a forward-genetic ENU mutagenesis screen to identify germline mutants prone to T-ALL and to study somatically-acquired genetic events linked to T cell oncogenesis8,9. Recently, our laboratory further extended the utility of lck:eGFP zebrafish. In double-transgenic rag2:hMYC (human MYC), lck:eGFP D. rerio that are known to develop T-ALL 10, we discovered that B-lineage ALL also occur11. Unlike T-ALL in this model, which fluoresce brightly due to high GFP expression, B-ALL are dimly-fluorescent due to low GFP levels, allowing fish with B-ALL to be distinguished grossly from those with T-ALL by fluorescent microscopy. This differential GFP expression also permits the separation of GFPlo B-ALL cells from GFPhi T-ALL cells using FACS11. Moreover, low lck expression is not unique to zebrafish B-ALL, as human B-ALL also express low levels of LCK11,12. Likewise, normal B-lineage cells of D. rerio, mice, and humans also express low levels of lck/Lck/LCK, with immature B cells having the highest expression11,13. On a per cell basis, B-lineage cells in lckeGFP zebrafish or derivative lines express 1-10% as much GFP as T lymphocytes. These GFPlo cells express characteristic B cell mRNAs such as pax5, cd79b, blnk, btk, ighm, ighz, and others, and can be purified from marrow, thymus, spleen, or peripheral blood11. Therefore, both B- and T-lineage cells can be isolated from lckeGFP zebrafish, and in the case of rag2hMYC, lckeGFP animals, B- and T-ALL cells as well11. Here, we present our protocol to efficiently FACS-purify non-malignant B cells from lck:eGFP zebrafish, and non-malignant or malignant B cells of rag2hMYC;lck:eGFP fish, using various source tissues. Such cells can likewise be quantified by flow cytometry without FACS isolation, if desired. 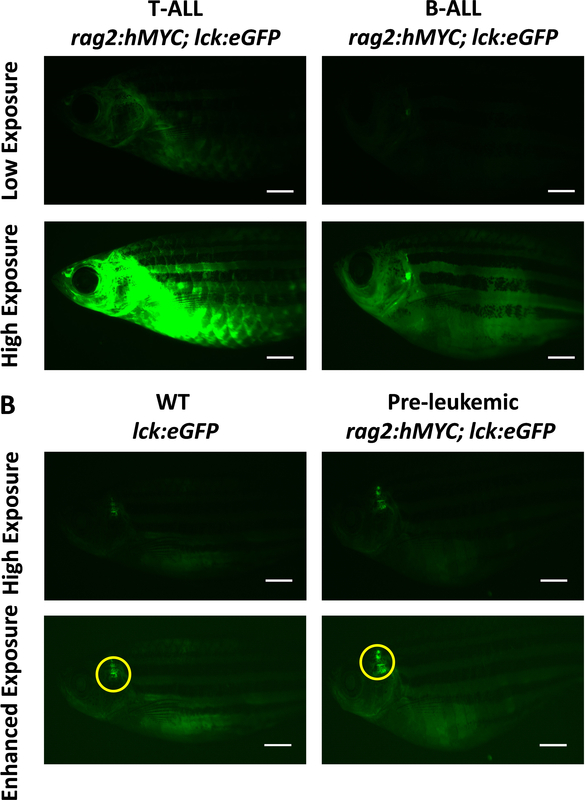 Discovery of low lck expression-and consequently, low GFP expression-by B cells opens new doors of experimental possibilities for lckeGFP zebrafish, such as in vivo B cell developmental studies. Thus, this transgenic line, first reported in 2004, has new life as we seek to utilize it to glean fresh insights concerning zebrafish adaptive immunity. All procedures involving zebrafish were approved by the Institutional Animal Care and Use Committee (IACUC) at the University of Oklahoma Health Sciences Center. Anesthetize the fish using 0.02% tricaine (MS-222) in fish system water. Examine 2–6 month old fish for fluorescent thymi, which are located at the dorsomedial aspect of the branchial cavity of zebrafish and other teleosts14. Use an epifluorescence microscope (470/40 excitation wavelength and 525/50 emission filter) to detect GFP. Prepare in advance 50 mL of filter-sterilized 1x Roswell Park Memorial Institute Medium (RPMI) containing 1% fetal bovine serum and 1% penicillin-streptomycin (sorting media). Unused sorting media can be stored at 4 °C for up to 2 months. Euthanize the fish by placing it in a beaker containing 0.2% Tricaine for approximately 5 min, followed by ice bath immersion. Confirm death by the cessation of opercular (gill) movement. Place the euthanized fish in a Petri dish and dissect lymphoid organs of interest, using the fluorescent microscope to dissect the GFP+ thymi14, and bright field microscopy settings to dissect the kidney marrow and spleen15. Results presented here were obtained using 3 month-old fish. Lymphocyte proportions and absolute numbers vary by age and genotype (see discussion for further detail). Place each dissected organ in a 1.5 mL tube containing 500 µL of cold sorting media. Homogenize the tissue on ice using a pestle micro-tube homogenizer. 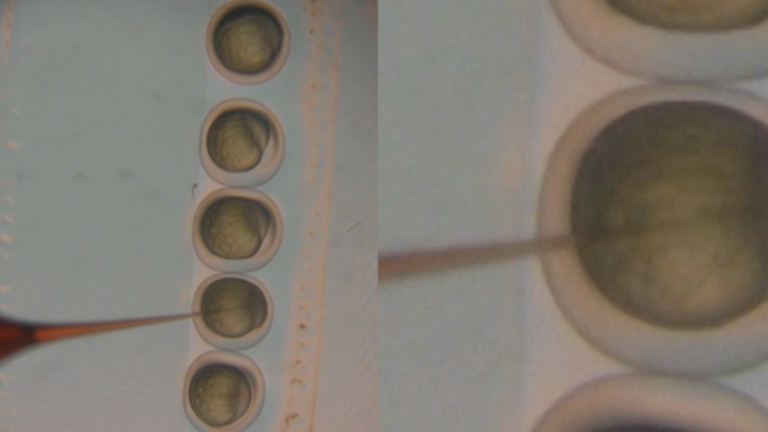 Pass homogenized tissue through a 35 µm mesh filter to generate a single cell suspension. Keep the cells on ice until analysis. Beginning at 2-4 months, microscopically screen rag2:hMYC; lck:eGFP fish for abnormal GFP patterns. NOTE: B cells are GFPlo in the lck:eGFP background, so B-ALL requires practice to recognize; T-ALL is obvious, because T cells are GFPhi. Consequently, the rag2:hMYC, lck:eGFP dual-transgenic line has two phenotypes: brightly-fluorescent T-ALL, which usually arise from the thymus and extend into the body, and dimly-fluorescent B-ALL. Using a fluorescent microscope, screen the fish using “low exposure” settings (200 ms, 2.4x gain) to identify bright T-ALL (Figure 1A) and “high exposure” (1.5 s, 3.4x gain) to identify dim B-ALL (Figure 1A). WT controls and pre-leukemic fish have GFP localized only in the thymus (Figure 1B). Anesthetize and examine the fish as described in steps 1.1–1.2. NOTE: Level 1: Fluorescence appears as a thymic tumor with only limited local spread. Level 2: Fluorescence appears beyond the thymus, involving <50% of the body. Level 3: Fluorescence extends beyond 50% of the body. Separate the fish with ALL from those without cancer. Monitor pre-leukemic fish (i.e., fish without GFP+ tumors) once monthly for the development of new ALL. By ~9 months, all rag2:hMYC, lck:eGFP fish develop T-ALL, B-ALL, or both. For T- or B-ALL cell isolation, select Level 3 fish (ALL involving >50% of the body), which yield more than 2 x 106 ALL cells, and typically many more. Euthanize the fish as in step 1.4. NOTE: There are two methods to obtain ALL cells: whole body homogenization and a peritoneal wash technique16. The methods differ in the absolute number of cells collected for sorting, and thus, the amounts of FACS time required and cost (see discussion for further detail). For either method, first place the euthanized fish in a Petri dish and using a razor blade, remove the head including the thymic region. This can be processed separately, if desired, or used for histological staining. Using a P1000 pipette, wash the fish peritoneal cavity with 500 µL of cold sorting media, collecting the cells and media in a 5 mL tube. Using a fresh pipette tip, inject an additional 200–300 µL of cold sorting media into the body cavity. Then, using the tip of the pipette, apply gentle pressure to the fish body to extrude the cells out of the body cavity. Collect this media and add to the 5 mL tube. Repeat step 2.8.2 2–3 times. Keep the collected cells in sorting media on ice. Filter the cell suspension though a 35 µm mesh filter prior to flow cytometry/FACS and keep the cells on ice until analysis. After removing the fish head, place the body in a 1.5 mL tube containing 200 µL of sorting media. Homogenize the body using a pestle micro-tube homogenizer. Add an additional 300 µL of cold sorting media. Filter the cell suspension though a 35 µm mesh filter. Add sorting media as needed to wash all cells through the filter, until only tissue debris remains on the filter. Keep the cells on ice until analysis. Set flow cytometric analysis and/or FACS parameters according to manufacturer’s guide. Acquire desired number of events to initially characterize the sample. Analyze 1 x 104 to 5 x 104 events prior to sorting to determining specific gates for subsequent sorting steps. Determine gates: Define lymphocyte and progenitor cell gates using forward scatter (FSC) and side scatter (SSC) parameters, excluding cellular debris (Figure 2A-C)17. FSC and SSC correspond to cell size/diameter and granularity, respectively. NOTE: GFP-, GFPlo, and GFPhi cells differ 10-to-100-fold in terms of their GFP fluorescence intensity, making separation of these populations straightforward (Figures 2-5). Live-dead discrimination can be assessed at this point using propidium iodine (PI) or 7-aminoactinomycin D (7-AAAD) viability staining. Previous experiments with PI typically demonstrate >95% viability of GFP+ cells after FACS. Exclude the cell doublets, according to the parameters of the FACS machine being used. Within the lymphoid and/or precursor gates, determine the number and percentage of GFP+ cells. Use phycoerythrin (PE) and GFP intensities, define gate for GFP- vs. GFPlo vs. GFPhi cells. NOTE: B cells exhibit dim GFP fluorescence and T cells show bright GFP in lck:eGFP lines. Many lymphoid organs or tumor samples contain both GFP+ populations. B-lineage cells/B-ALL are GFPlo and T-lineage cells/T-ALL are GFPhi. Define gates to distinguish between GFP-, GFPlo, and GFPhi cells, and collect these populations separately (Figure 2A-C, Figure 3A-C, Figure 4A and Figure 5A). Sort each cell population into different 15 mL polypropylene tubes containing 2 mL of sorting media, or directly into different 1.5 mL tubes containing an appropriate buffer for further analyses (e.g., RNA, DNA, or protein extraction, allo-transplantation, etc.). Keep purified cells on ice prior to further analyses. We used flow cytometry to analyze and FACS to isolate GFPlo and GFPhi cells from thymus, kidney marrow, and spleen of lck:eGFP transgenic zebrafish. Analysis of 3-month-old fish revealed the thymus contained mostly GFP+ lymphocytes. GFP+ cells were largely confined to the lymphoid gate previously described by Traver et al.17. Two distinct GFP+ populations, GFPloand GFPhi,can be observed in the thymus. GFPhi lymphocytes represented a higher percentage, ~60%, while GFPlo cells were less abundant, representing ~40% of total thymic lymphocytes (Table 1). Unlike mammals, fish hematopoietic marrow is localized within the kidney, rather than within bone. We determined B cells residing in kidney marrow also express low levels of GFP (Figure 2B and Figure 3B). GFPlo cells in marrow were abundant, while GFPhi cells were scarce (Figure 2B and Figure 3B)), indicating that only a small percentage of T lymphocytes were present in the marrow at 3 months of age. Splenic samples likewise showed higher percentages of GFPlo than GFPhi cells (Figure 2C and Figure 3C). We also analyzed non-malignant lymphocytes from thymus, marrow, and spleen of double-transgenic lck:eGFP; rag2:hMYC zebrafish, which are prone to both B- and T-ALL11. In fish that had not yet developed ALL, results from thymus, marrow, and spleen were similar to single-transgenic lck:eGFP fish. However, the numbers of lymphocytes per organ were increased (Figure 3), presumably due to MYC-driven expansion of immature B and T cell populations where the rag2 promoter is active. We also analyzed double-transgenic fish with B- and/or T-ALL that had developed fluorescent cancers by 6 months. Predictably, B-ALL fish with dimly-fluorescent cancers contained mostly GFPlo cells (Figure 4A). In contrast, brightly-fluorescent fish can harbor either isolated T-ALL or mixed populations of both GFPlo B-ALL and GFPhi T-ALL cells (Figure 5). An example of mixed ALL, which contains distinct B- and T-ALL, is shown here (Figure 5). To confirm the identities of GFPlo and GFPhi cells as B- and T-lineage, respectively, we analyzed B- and T-cell-specific transcripts by quantitative real-time PCR (qRT-PCR). Our results show GFPlo cells express higher levels of B cell transcripts and GFPhi cells express higher levels of T cell genes (Figure 2D, Figure3D, Figure4B and Figure5B). Furthermore, expression of lck and GFP in GFPlo ALL correspond to the dim in vivo GFP fluorescence of B-ALL (Figure 2D, Figure3D, Figure4B and Figure5B; qRT-PCR conditions and primers sequences previously described by Borga et al.)11. Figure 1: Distinct fluorescence patterns in lck:eGFP transgenic fish. (A) Fluorescent microscopy images of rag2:hMYC; lck:eGFP fish with brightly-fluorescent T-ALL (left) or dimly-fluorescent B-ALL (right). T-ALL is visible with low exposure settings; B-ALL can only be seen using high exposures. (B) High exposure settings show faint thymic fluorescence (yellow circles) in wild-type lck:eGFP fish (left) and rag2:hMYC; lck:eGFP double-transgenic fish without ALL (right). Scale bars = 20 mm. Please click here to view a larger version of this figure. Figure 2: Lymphocyte populations in lck:eGFP zebrafish. Images at top show a 3 month-old WT, lck:eGFP fish with high exposure settings or computer-enhancement (to facilitate visualization). Scale bars = 20 mm. 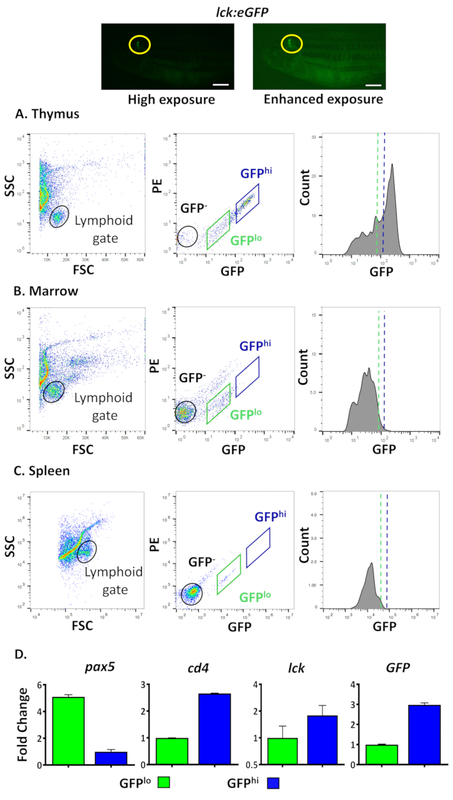 Flow cytometric analyses of thymus (A), marrow (B), and spleen (C). Left panels show FSC (x-axis) and SSC (y-axis), with black ovals indicating lymphocyte gates. Middle panels depict fluorescence-based gating with GFP (x-axis) and PE (y-axis). GFPhi (blue rectangle), GFPlo (green rectangle) and GFP- (black ovals) populations are shown. Right panels display histograms of GFPhi and GFPlo cells. Dashed lines indicate gating criteria in middle panels. (D) WT lck:eGFP thymi sorted for GFPhi (blue) and GFPlo (green). Expression of B cell gene (pax5), T (cd4) cell-specific genes), lck and GFP. Results are normalized to housekeeping genes (β-actin and eef1a1l1) and shown as fold-change ± Standard Error (S.E). Please click here to view a larger version of this figure. Figure 3: Lymphocyte populations in pre-leukemic rag2:hMYC; lck:eGFP zebrafish. Images at top show a 3-month-old rag2:hMYC; lck:eGFP fish with high and computer-enhanced exposures. Scale bar = 20 mm. Panels of parts A-D are depicted in identical format to Figure 2. (D) Expression of pax5, cd4, lck, and GFP in FACS-purified thymic GFPlo (green) GFPhi (blue) cell populations of lck:eGFP fish. qRT-PCR results are shown as fold-change ± S.E. Please click here to view a larger version of this figure. Figure 4: Analysis of B-ALL rag2:hMYC; lck:eGFP transgenic fish. (A) Top: 6-month-old rag2:hMYC; lck:eGFP fish with B-ALL using high exposure setting. Flow cytometric analyses of tumor cells isolated from fish body are identical format to Figure 2. (B) Gene expression in B-ALL GFPlo cells (green gate in Figure 4A), rag2:hMYC; lck:eGFP GFPhi thymocytes (blue gate in Figure 3A), and T-ALL GFPhi cells (blue gate in Figure 5A). Expression of B (pax5, cd79a) and T (cd4) cell-specific genes, lck, and GFP. Results are normalized to housekeeping genes (β-actin and eef1a1l1) and shown as fold-change ± S.E. Scale bar = 20 mm. Please click here to view a larger version of this figure. Figure 5: Analysis of mixed ALL rag2:hMYC; lck:eGFP transgenic fish. (A) Top: 6 month-old rag2:hMYC; lck:eGFP fish with mixed-ALL using high exposure setting. Flow cytometric analyses of tumor cells isolated from fish body are identical format to Figure 2. (B) GFPhi (blue) and GFPlo (green) FACS gates. Expression of B (pax5, cd79a) and T (cd4) cell-specific genes, lck, and GFP. Results are normalized to housekeeping genes (β-actin and eef1a1l1) and shown as fold-change ± S.E. Scale bar = 20 mm. Please click here to view a larger version of this figure. We developed and provide a protocol to isolate B cells from lck:eGFP transgenic zebrafish, adding this to other D. rerio models with B-lineage labels3,4. Somewhat surprisingly, the identification of GFPlo B cells in this line went unnoticed since its description in 2004.Generally, lck is considered to be T cell-specific6, but recent studies found unexpected lck expression by natural killer and myeloid cells, as well as in B cells as shown here18,19. In agreement with our discovery that zebrafish B cells are GFPlo, pre-B, naïve, and mature B cells in humans also express low levels of LCK11,13. Due to the differing GFP levels in B and T cells of these fish, cells of both lineages can now be isolated from this line. Although these animals have classically been used to study thymic T lymphocyte development and tracking, we demonstrate that similar studies are also possible with B cells. To this end, we identify B cells in thymus, kidney marrow, and spleen here, and in peripheral blood and elsewhere in prior work11. Recognizing B-ALL in rag2:hMYC; lck:eGFP fish requires a keen eye, but with practice, is straightforward. Next, choosing which method to use to purify ALL cells is critical. Here, we present two methods: peritoneal wash and whole body homogenization. Peritoneal washing yields a much lower number of total cells, but a very high percentage of GFP+ cells. 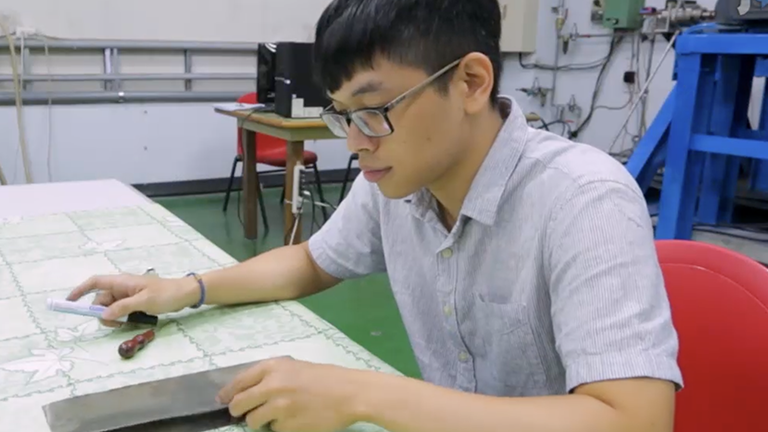 Consequently, little FACS time is required, minimizing the cost. For downstream applications, where total yield is less important (e.g., qRT-PCR), this is more efficient. Alternatively, whole body homogenization results in larger single cell suspensions containing many more cells, but a lower percentage of cells will be GFP+. Thus, more FACS time is required to collect the same number of GFP+ cells as with peritoneal washing, but millions more cells can be purified. For downstream studies, where high yield is important (e.g., Western blot), this may offset the added cost. In addition, for ALL studies, total body homogenization captures the diversity of cancer cells present, more accurately representing tumor heterogeneity. Although not listed in our protocol, it is also feasible to dissect only GFP+ body regions/organs from fish with ALL for homogenization by mincing in a Petri dish, thus decreasing total FACS time and cost, akin to peritoneal washing. 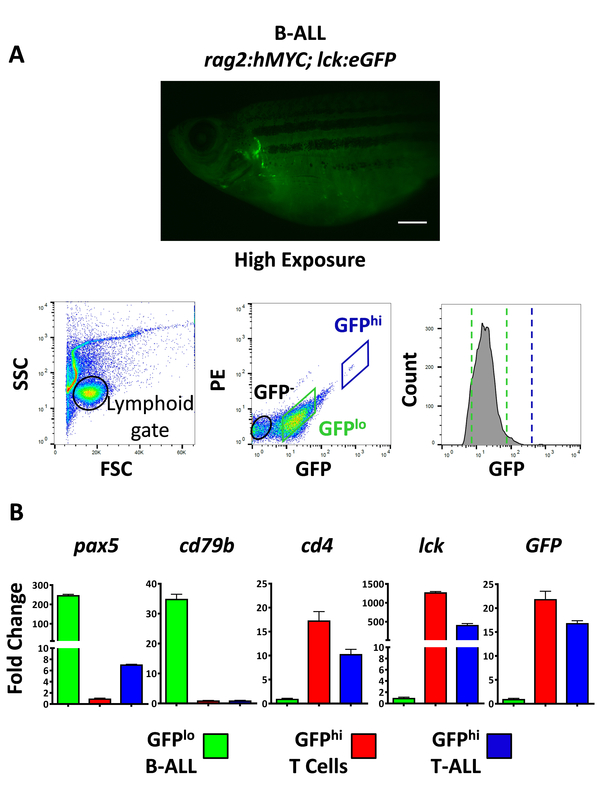 Thymic GFP expression in lck:eGFP fish showed that GFP is detectable as early as 5 dpf6. Our studies here were performed in adult fish 3 months of age or older, and show that at this age, B cells are abundant in kidney marrow and spleen, but T cells are rare. Subsequent studies with fish of different ages will be required to determine if T cells are more prevalent at different time points. Likewise, at 3 months, T cells are enriched in the thymus, but a considerable number of thymic B cells are also present. If these lymphocyte populations vary at different ages is currently unknown, but overall, thymic fluorescence fades in lck:eGFP fish beginning at sexual maturity (~3 months), so it is likely that T cell numbers diminish with increasing age, and B cells may also. Likewise, when GFPlo B cells colonize the zebrafish thymus is currently unknown. Using lck:eGFP fish, it is now possible to monitor thymic B and T cell development, influx, efflux, and the specific kinetics of these events. In addition, such questions are also pertinent to other anatomic sites where B cells reside, such as kidney marrow, spleen, blood, and intestine (data not shown). Besides B cell developmental studies, we recently found B-ALL in lck:eGFP; rag2:hMYC double-transgenic fish11. Transgenic rag2:hMYC was known to induce T-ALL10 but B-ALL had gone unrecognized. Due to the high penetrance of this oncogene, both types of ALL are prevalent in these fish, and many fish actually develop both ALL types simultaneously11. Since B-ALL are GFPlo, while T-ALL are GFPhi, varying GFP expression allows these two entities to be isolated by FACS, even when occurring in the same animal (Figure 5A). 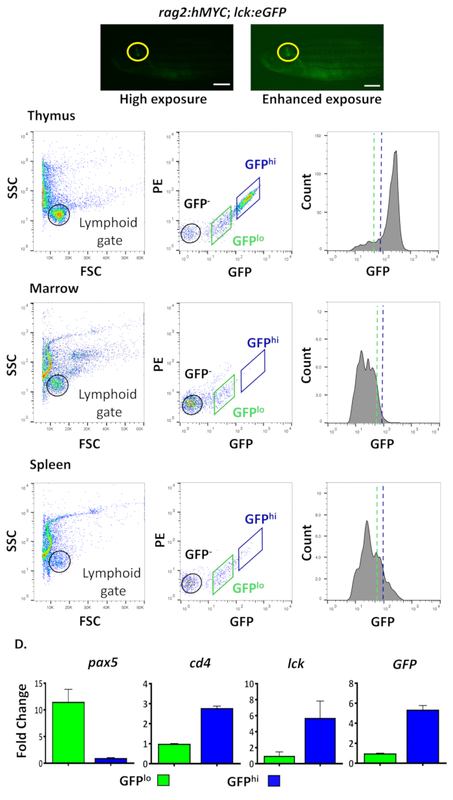 Crucially, in both normal and malignant lymphocytes, qRT-PCRresults demonstrate that GFPlo and GFPhi cells consistently correspond to the B- and T-lineages, respectively (Figure 2 and Figure 3). The untapped potential of lck:eGFP fish was central to this work, highlighting the fact that many pre-existing transgenic lines likely have utility beyond their intended purpose. Here, we present a novel protocol to isolate B and T cells from D. rerio with transgenic lck:eGFP, opening the door to new investigational avenues concerning normal and malignant B lymphocytes. The results of such studies will undoubtedly re-vitalize what has already been a valuable resource to the hematopoiesis, lymphopoiesis, and cancer biology fields. We would like to thank Megan Malone-Perez for zebrafish care, and the OUHSC flow cytometry core. This work was supported by grants from Hyundai Hope on Wheels, the Oklahoma Center for the Advancement of Science and Technology (HRP-067), an NIH/NIGMS INBRE pilot project award (P20 GM103447). JKF holds the E.L. & Thelma Gaylord Endowed Chair in Pediatric Hematology-Oncology of the Children's Hospital Foundation. Paik, E. J., Zon, L. I. Hematopoietic development in the zebrafish. International Journal of Developmental Biology. 54, (6-7), 1127-1137 (2010). Kasheta, M., et al. Identification and characterization of T reg-like cells in zebrafish. Journal of Experimental Medicine. 214, (12), 3519-3530 (2017). Liu, X., et al. Zebrafish B Cell Development without a Pre-B Cell Stage, Revealed by CD79 Fluorescence Reporter Transgenes. Journal of Immunology. 199, (5), 1706-1715 (2017). Page, D. M., et al. An evolutionarily conserved program of B-cell development and activation in zebrafish. Blood. 122, (8), e1-e11 (2013). Schorpp, M., et al. Conserved functions of Ikaros in vertebrate lymphocyte development: genetic evidence for distinct larval and adult phases of T cell development and two lineages of B cells in zebrafish. Journal of Immunology. 177, (4), 2463-2476 (2006). Langenau, D. M., et al. In vivo tracking of T cell development, ablation, and engraftment in transgenic zebrafish. Proceedings of National Academy of Sciences U S A. 101, (19), 7369-7374 (2004). Trede, N. S., Langenau, D. M., Traver, D., Look, A. T., Zon, L. I. The use of zebrafish to understand immunity. Immunity. 20, (4), 367-379 (2004). Frazer, J. K., et al. Heritable T-cell malignancy models established in a zebrafish phenotypic screen. Leukemia. 23, (10), 1825-1835 (2009). Rudner, L. A., et al. Shared acquired genomic changes in zebrafish and human T-ALL. Oncogene. 30, (41), 4289-4296 (2011). Gutierrez, A., et al. Pten mediates Myc oncogene dependence in a conditional zebrafish model of T cell acute lymphoblastic leukemia. Journal of Experimental Medicine. 208, (8), 1595-1603 (2011). Borga, C., et al. Simultaneous B and T cell acute lymphoblastic leukemias in zebrafish driven by transgenic MYC: implications for oncogenesis and lymphopoiesis. Leukemia. (2018). Haferlach, T., et al. Clinical utility of microarray-based gene expression profiling in the diagnosis and subclassification of leukemia: report from the International Microarray Innovations in Leukemia Study Group. Journal of Clinical Oncology. 28, (15), 2529-2537 (2010). Novershtern, N., et al. Densely interconnected transcriptional circuits control cell states in human hematopoiesis. Cell. 144, (2), 296-309 (2011). Menke, A. L., Spitsbergen, J. M., Wolterbeek, A. P., Woutersen, R. A. Normal anatomy and histology of the adult zebrafish. Toxicology Pathology. 39, (5), 759-775 (2011). Gupta, T., Mullins, M. C. Dissection of organs from the adult zebrafish. Journal of Visualized Experiments. (2010). Pruitt, M. M., Marin, W., Waarts, M. R., de Jong, J. L. O. Isolation of the Side Population in Myc-induced T-cell Acute Lymphoblastic Leukemia in Zebrafish. Journal of Visualized Experiments. (37), (2017). Traver, D., et al. Transplantation and in vivo imaging of multilineage engraftment in zebrafish bloodless mutants. Nature Immunology. 4, (12), 1238-1246 (2003). Carmona, S. J., et al. Single-cell transcriptome analysis of fish immune cells provides insight into the evolution of vertebrate immune cell types. Genome Research. 27, (3), 451-461 (2017). Tang, Q., et al. Dissecting hematopoietic and renal cell heterogeneity in adult zebrafish at single-cell resolution using RNA sequencing. Journal of Experimental Medicine. 214, (10), 2875-2887 (2017).